Guarana is the common name for a South American woody vine or sprawling shrub, Paullinia cupana in the Sapindaceae family, with large, pinnately compound evergreen leaves with five leaflets, clusters of small flowers, and red to brown globular fruits that split open at maturity and have black seeds (one per fruit). Guarana also is the name of a nonalcoholic carbonated beverage produced from the seeds. The Guarana plant is native to the Amazon basin and especially common in Brazil. The high concentration of caffeine in the seeds, which is more concentrated than even in coffee beans, provides for the plants a defense mechanism, helping to repel plant pathogens of the fruit and its seeds. For human beings, the caffeine is one of the active ingredients that has made guarana commercially popular in Brazil, with increasing importance as a trade commodity to Europe, North America, and Asia. 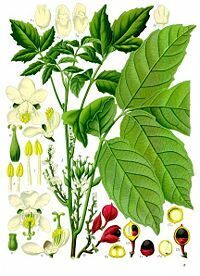 Paullinia cupana, or guarana, is a member of the Sapindaceae, a family of flowering plants that also include maple, horse chestnut, and lychee. In cultivation, guarana is often referred to as Paullinia cupana variety sorbilis (Erickson et al. 1984). Guarana grows in the forest primarily as a liana (Erickson et al. 1984). Lianas are long-stemmed, usually woody vines that are rooted in the soil at ground level and use trees, as well as other means of vertical support, to climb up to the canopy in order to get access to well-lit areas of the forest. P. cupana has woody stems and is supported by large tree trunks, climbing high into the forest canopy. However, when cultivated, it grows in the form of a sprawling shrub that is perhaps two meters tall and a diameter of about four meters (Erickson et al. 1984). Guarana is an evergreen tree. It features large leaves that are pinnately compound, with five shiny leaflets. The stems have deep longitudinal furrows. The flowers are small and white, with male and female flowers on the same tree. Guarana is best known for its fruit, which is about the size of a coffee berry and with a color that ranges from brown to red. The fruit splits open at maturity. Each fruit harbors one black seed. The black seeds are partly covered by white arils. The guarana fruit contains approximately five times as much caffeine as coffee beans (Weinberg and Bealer 2001). Although the substance extracted was named guaranine, and thought to be a unique chemical, it is in actuality caffeine, albeit impure caffeine with some properties of the host plant, such as bound to a particular phenol or tannin (Taylor 2005). Xanthines such as caffeine are bound to such substances but are freed during the roasting process (Taylor 2005). As with other plants producing caffeine, the high concentration of caffeine is a defensive toxin that repels pathogens from the berry and its seeds (Ashihara et al. 2008). Guarana was used by natives in the Amazon Basin prior to the arrival of Europeans. Indian tribes, such as the Guaraní used it, and still use it, for a wide variety of medicinal purposes (Taylor 2005; Angelo et al. 2008; Erickson et al. 1984). The Guaranís also would make tea by shelling and washing the seeds, followed by pounding them into a fine powder. The powder is kneaded into a dough and then shaped into cylinders. This product is known as guarana bread or Brazilian cocoa, which would be grated and then immersed into hot water along with sugar (Weinberg and Bealer 2001). This plant was introduced to western civilization in the seventeenth century following its discovery by Father Felip Betendorf. By 1958, guarana was commercialized (Weinberg and Bealer 2001). Guarana plays an important role in Tupi and Guaraní Brazilian culture. The color contrast between the seed and the fruit when it has been split open has been likened to eyeballs; this has formed the basis of a myth. According to this myth, dating back to the Sateré-Maué tribe, guarana's domestication originated with a deity killing a beloved village child. In order to console the villagers, a more benevolent god plucked the left eye from the child and planted it in the forest, resulting in the wild variety of guarana. The god then plucked the right eye from the child and planted it in the village, giving rise to domesticated guarana (Beck 2005). The word guarana, derived from the Guaraní tribe (Taylor 2005) comes from the Portuguese guaraná, which has its origins in the Sateré-Maué word warana (Merriam-Webster 2008). Below are some of the chemicals found in guarana (Duke 2008; Duke 1992). According to the Biological Magnetic Resonance Data Bank, when guaranine is defined as only the caffeine chemical in guarana, it is identical to the caffeine chemical derived from other sources, for example coffee, tea, and mate. Guaranine, theine, and mateine are all synonyms for caffeine when the definitions of those words include none of the properties and chemicals of their host plants except the chemical caffeine (BMRB 2008). The amount of caffeine in guarana, about 4 to 8 percent, is higher than that in the coffee bean (1-2.5 percent) or Yerba mate leaves (0.7-2 percent) or chocolate (0.25 percent) (Taylor 2005). Natural sources of caffeine contain widely varying mixtures of xanthine alkaloids other than caffeine, including the cardiac stimulants theophylline and theobromine and other substances such as polyphenols which can form insoluble complexes with caffeine (Balentine et al. 1998). Guarana soft drinks are very popular in Brazil. Guarana is used in sweetened or carbonated soft drinks and energy shots, an ingredient of herbal tea or contained in capsules. Generally, South America obtains most of its caffeine from guarana (Weinberg and Bealer 2001). Guarana is commercially produced largely in the middle Amazon region of northern Brazil (Erickson et al. 1984). Brazil, which is the third-largest consumer of soft drinks in the world (Weaver and Bealer 2001), produces several soft drink brands from guarana extract. Guarana-based drinks exceed Brazilian sales of cola drinks (Moffett and Deogun 1999). Guarana has long been used medicinally. Past and present tribal uses include as a pain reliever, cardiovascular drug, preventative for arteriosclerosis, stimulant, and tonic to treat diarrhea, migraine, fever, hypertension, neuralgia, and dysentery. It is used by present-day Brazilians to overcome heat fatigue, for obesity, for intestinal gas, to detoxify the blood, and other such purposes. It is felt to increase mental alertness and increase stamina and physical endurance (Taylor 2005). As guarana is rich in caffeine, it is of interest for its potential effects on cognition. In rats, guarana increased memory retention and physical endurance when compared with a placebo (Espinola et al. 1997). A 2007 human pilot study (Haskell et al. 2007), assessed acute behavioral effects to four doses (37.5 mg, 75 mg, 150 mg and 300 mg) of guarana extract. Memory, alertness, and mood were increased by the two lower doses, confirming previous results of cognitive improvement following 75 mg guarana. These studies have not been evaluated by any United States government agencies, so within the U.S. there is no medical or regulatory approval for use of guarana to enhance cognition. In the United States, guarana has the status of being generally recognized as safe (GRAS) (Heneman and Zidenberg-Cherr 2007). Preliminary research has shown guarana may have metabolic effects. One study showed an average 11.2 pound (5.1 kilogram) weight loss in a group taking a mixture of yerba mate, guarana, and damiana, compared to an average one pound loss in a placebo group after 45 days (Anderson and Foght 2001). Although inconclusive about specific effects due only to guarana, this study differs from another showing no effect on body weight of a formula containing guarana (Sale et al. 2006). Guarana extract reduced aggregation of rabbit platelets by up to 37 percent below control values and decreased platelet thromboxane formation from arachidonic acid by 78 percent below control values (Bydlowski et al. 1991). It is not known if such platelet action has any effect on the risk of heart attack or ischemic stroke (Nicolaou et al. 1979). Other laboratory studies showed antioxidant and antibacterial effects (Taylor 2005), and also fat cell reduction in mice (when combined with conjugated linoleic acid) from chronic intake of guarana (Terpstra et al. 2002). From anecdotal evidence of excessive consumption of energy drinks, guarana may contribute (alone or in combination with caffeine and taurine) to onset of seizures in some people (Iyadurai and Chung 2007). Anderson, T., and J. Foght. 2001. Weight loss and delayed gastric emptying following a South American herbal preparation in overweight patients. J Hum Nutr Diet 14(3): 243-250. Retrieved January 17, 2009. Ângelo, P. C. S., C. G. Nunes-Silva, M. M. Brígido, J. S. N. Azevedo, E. N. Assunção, A. R. B. Sousa, F. J. B. Patrício, et al. Guarana (Paullinia cupana var. sorbilis), an anciently consumed stimulant from the Amazon rain forest: The seeded-fruit transcriptome. Plant Cell Reports 27(1): 117-124. Retrieved January 18, 2009. Ashihara, H., H. Sano, and A. Crozier. 2008. Caffeine and related purine alkaloids: Biosynthesis, catabolism, function and genetic engineering. Phytochemistry 69(4): 841-856. Retrieved January 17, 2008. Balentine, D. A., M. E. Harbowy, and H. N. Graham. 1998. Tea: The plant and its manufacture; Chemistry and consumption of the beverage. In G. A. Spiller, ed., Caffeine. Boca Raton, FL: CRC Press. ISBN 0849326478. Beck, H. T. 2005. Caffeine, alcohol, and sweeteners. In G. Prance and M. Nesbett, eds., Cultural History of Plants. New York: Routledge. ISBN 0415927463. Biological Magnetic Resonance Data Bank (BMRB). 2008. Caffeine. Biological Magnetic Resonance Data Bank, University of Wisconsin-Madison. Retrieved January 17, 2009. Bydlowski, S. P. et al. 1991. An aqueous extract of guarana (Paullinia cupana) decreases platelet thromboxane synthesis. Braz J Med Biol Res 24(4): 421–424. Duke, J. A. 2008. Guarana. Dr. Duke's Phytochemical and Ethnobotanical Databases. Retrieved January 17, 2009. Duke, J. A. 1992. Handbook of Phytochemical Constituents of GRAS Herbs and Other Economic Plants. Boca Raton, FL. CRC Press. ISBN 0849336724. Erickson, H. T., M. P. F. Correa, and J. R. Escoba. 1984. Guaraná (Paullinia cupana) as a commercial crop in Brazilian Amazonia. Economic Botany 38(3): 273-286. Retrieved January 18, 2009. Espinola, E. B., R. F. Dias, R. Mattei, and E. A. Carlini. 1997. Pharmacological activity of guarana (Paullinia cupana Mart.) in laboratory animals. J Ethnopharmacol 55(3): 223–9. Retrieved January 17, 2009. Haskell, C. F., D. O. Kennedy, K. A. Wesnes, A. L. Milne, and A. B. Scholey. 2007. A double-blind, placebo-controlled, multi-dose evaluation of the acute behavioural effects of guarana in humans. J Psychopharmacol. 21(1):65-70. Retrieved January 17, 2008. Heneman, K., and S. Zidenberg-Cherr. 2007. Energy drinks. University of California, Davis. Retrieved January 17, 2008. Iyadurai, S. J., and S. S. Chung. 2007. New-onset seizures in adults: Possible association with consumption of popular energy drinks. Epilepsy Behav. 10(3): 504-508. Retrieved January 17, 2008. Merriam-Webster. 2008. Guarana. Merriam-Webster Online. Retrieved January 18, 2009. Nicolaou, K. C., R. L. Magolda, J. B. Smith,1979. Synthesis and biological properties of pinane-thromboxane A2, a selective inhibitor of coronary artery constriction, platelet aggregation, and thromboxane formation. Proc. Natl. Acad. Sci. USA 76(6): 2566–2570. PMID 288046. Retrieved January 18, 2009. Prance, G. T., and M. Nesbitt. 2005. The Cultural History of Plants. New York: Routledge. ISBN 0203020901. Sale, C., R. C. Harris, S. Delves, and J. Corbett. 2006. Metabolic and psychological effects of ingesting extracts of bitter orange, green tea and guarana at rest and during treadmill walking in overweight males. Int J Obes (Lond). 30(5):764-773. Retrieved January 18, 2009. Taylor, L. 2005. Database File for: Guaraná (Paullinia cupana). From L. Taylor, The Healing Power of Rainforest Herbs. Garden City Park, NY: Square One Publishers. ISBN 0757001440. Terpstra, A. H. M., A. C. Beynen, H. Everts, et al. 2002. The decrease in body fat in mice fed conjugated linoleic acid is due to increases in energy expenditure and energy loss in the excreta. J Nutr 132: 940–945. Retrieved January 18, 2009. Weinberg, B. A., and B. K. Bealer. 2001. The World of Caffeine: The Science and Culture of the World's Most Popular Drug. New York: Routledge. ISBN 0415927226. This page was last modified on 21 January 2014, at 19:52.